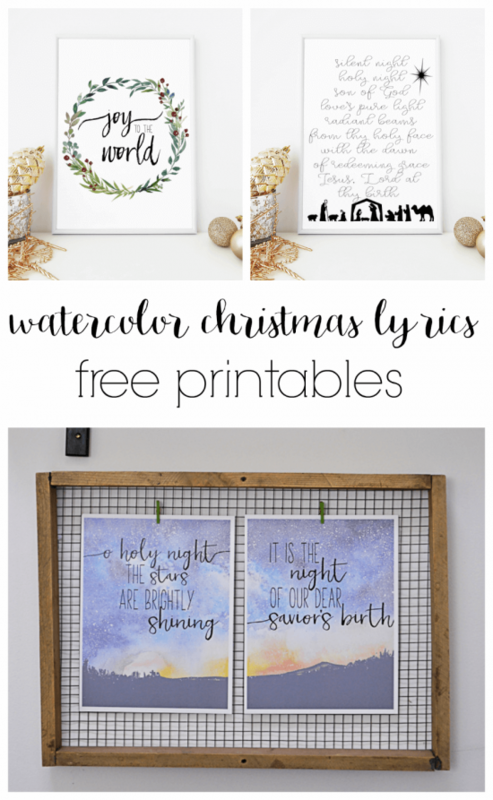 All you need is a printer to add these festive watercolor printables into your Christmas decor. 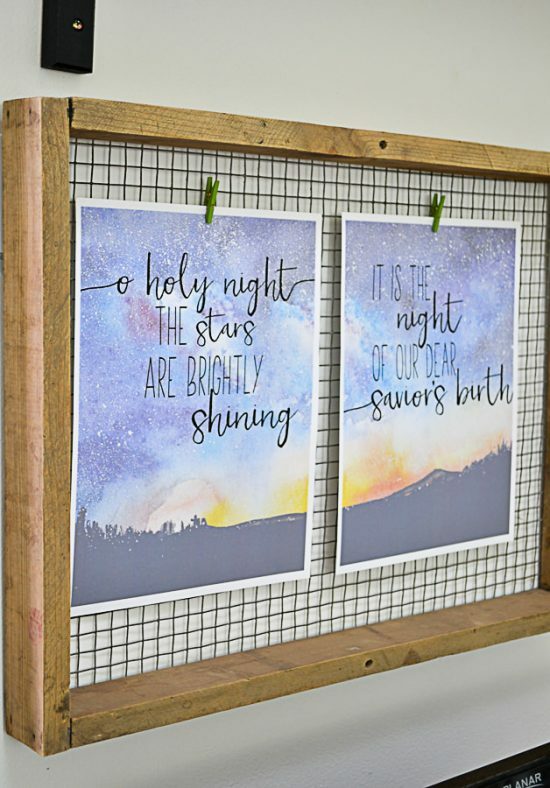 These free printables of Christmas song lyrics are great added to picture frames, clip boards, bulletin boards, or clipped up to the wall as an easy way to add new decor, without spending any money! I love easy and cheap holiday decorations. I rarely buy new Christmas decorations, but instead figure out ways to make my own, use other items that can be easily spruced up with Christmas flair, or buy vintage decorations from estate and garage sales. Considering that I love decorating without spending a lot of money, free printables have a special place in my heart. Last year, I made a couple of Christmas printables that I used in my own home, but also offered up to other budget-conscious decorators here on the blog. This year, I’m excited to offer you a few more printables that I’ve created, and then you’ll find a bunch of other free printables at the bottom of this post as well. I’ve put a few of my favorite Christmas song lyrics into designs, and they are free to you to print. 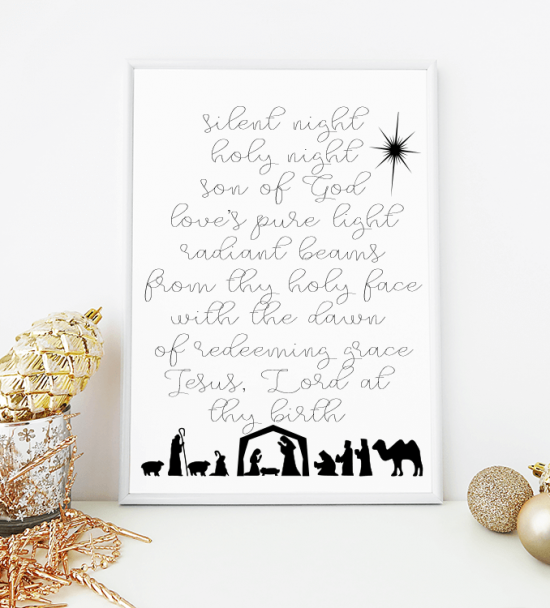 To print the Silent Night design, just click on the caption below the image and download the graphic. I have two other designs that you can print as well, all I ask is that you subscribe to my email list to which I send monthly or bi-monthly newsletters with updates on new posts. Plus, you’ll gain access to my printable library of graphics, where you’ll find the three designs from last year, along with some other printables and graphics to help you decorate your home without spending a ton of money! Here’s a look at our desk area ready for Christmas. 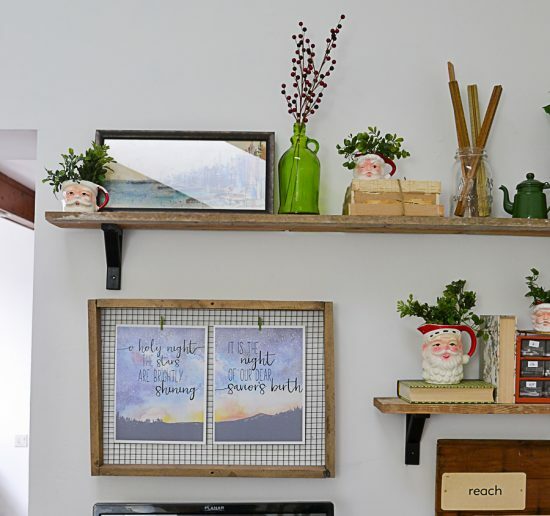 I basically just added the vintage santa mugs with some greenery, a green vintage jug with berries, and this printable and called it a day. If you’d like access to any of these graphics, please just subscribe to my newsletter below. Please understand, these files are for personal use only. You may not use them in products to sell to others. If you would like a commercial license for any of these graphics, please contact me via email: refreshliving1(at)gmail(dot)com. Thanks for following this license agreement! Check out these other free printables for the holiday season! You have so many beautiful printables! Thanks for sharing. Definitely going to use a couple as gifts. These are all so beautiful! 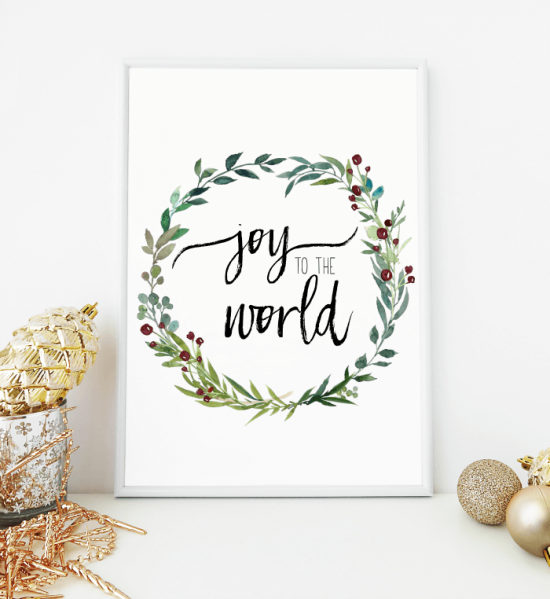 I cant wait to print the joy to the world wreath one. These are absolutely gorgeous Jenny!! !